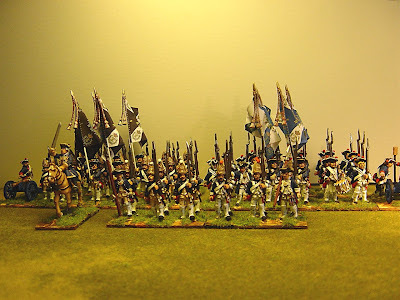 The Hessian Brigade of my second column (Division) under the command of Lt.General Freiherr von Sporcken is finished. The top two pictures show Regiment Gilsa, consisting of two small battalions, after the 1760 changes, which joins Regiment Mansbach in the Brigade. The third picture shows the converged grenadier battalion (name unknown?) consisting of the grenadier companies of Mansbach and Gilsa. The final picture shows the brigade arrayed with its battalion guns. Those sharp-eyed amongst you will note that I have slightly changed the brigade structure from that described in the OOB a few posts ago. A word on Gilsa. Prior to 1760 this was regiment Fürstenberg, a regular musketeer regiment. 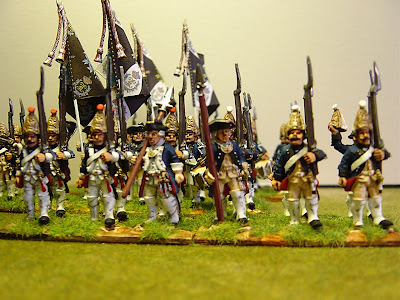 Besides changing its facing colour from red to black, the regiment became a Fusilier regiment, adopting the small fusilier mitre in a direct copy of the Prussian model. During the American War of Independence the regiment was known as von Knyphausen after its Inhaber at the time. Sent to North America in 1776, most of the regiment was captured at Trenton in December 1776. 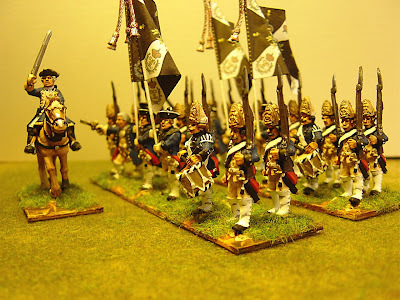 This is the only fusilier regiment I intend to have in this Pragmatic/SYW army and they make a nice change. By the way, and I almost forgot to mention it, the officer commanding this Brigade is Maj-General Bischhausen - there's a name to conjure with! My next post, at the weekend, will be about Colonel Luckner, whose figure I have painted but which needs basing. Nic at Eureka kindly sent me a dismounted Saxon hussar which I have painted and added to the base. More on that later as the dismounted Saxon is one of the finest 25mm figures I have ever painted. 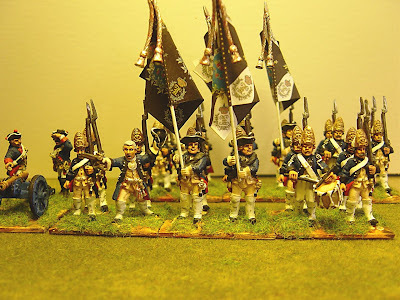 My next project is to finish off this Division's first Brigade (consisting of Hanoverians) as well as a box of Perry plastic Napoleonics. I always look at the standard bearers and wonder if the sculptors have ever carried a traditional flag, It's very top heavy and you try to keep it as low and as upright as possible.